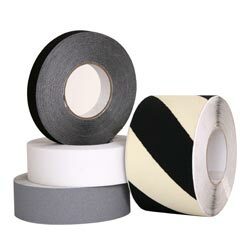 Anti Slip Tape is a self adhesive tape designed for industrial and domestic applications. It is meant to be applied to areas that are slippery when dry and wet (e.g. tiled ramps, steps, walkways, ect.) Although Anti Slip Tape is water resistant it is not designed for areas that are constantly wet or submersed. Anti Slip Tape must be applied to non-porous substrates. If you wish to apply to porous surfaces, the area must be sealed or painted before application of Anti Slip Tape. In sealed or painted areas Anti Slip Tape bond is only as good as the sealer or paint bond. Ensure the substrate is clean and free from all oil, wax, dirt and other residues. Once the substrate is clean, ensure that it is dry before applying the Anti Slip Tape. Cut the strip to size required and round off any corners. Peel back the wax paper and carefully holding the edges; bend the top side away from the substrate. Take care to line the tape correctly before making contact with the substrate. Press the tape down onto the substrate and tap lightly with a rubber mallet, beginning from the inside and working your way to the edges. Allow to set for approx. 30min before allowing light traffic. Only allow heavy traffic after 12 hours. For extra protection in severe traffic and commonly wet areas, seal the edges with a good quality silicone sealer. Rough and porous areas need to be treated before application of Anti Slip Tape. Contact TFC for advice on the correct sealer. Remember the adhesion of Anti Slip Tape depends on the quality of the basecoat. When using a rubber mallet, tap gently so as not tear the tape. Maintenance requires gentle brushing with a stiff plastic brush, with just enough force to loosen sediment whilst ensuring not to damage the surface or pull the strip away from the substrate. If possible brush from the center outwards. All sharp corners must be rounded off to prevent them from curling upwards and lifting.